NEW: Michael Moore will join for the Q&A, representing the Traverse City Film Festival, that he co-founded, where The Wanted 18 won the Best Documentary Prize. The Wanted 18 is Palestine’s official entry for the Best Foreign Language Film Academy Award. STF will be the first New York screening with the Palestinian director Amer Shomali in attendance. 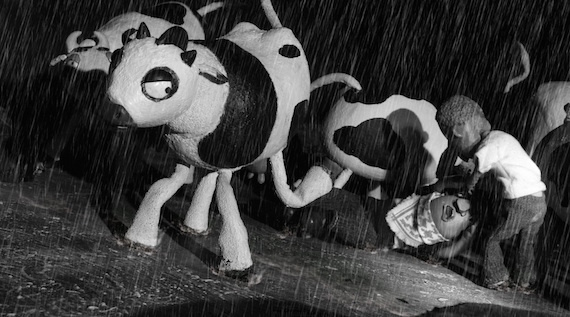 Through a clever mix of stop motion animation and interviews, The Wanted 18 recreates an astonishing true story: the Israeli army’s pursuit of 18 cows, whose independent milk production on a Palestinian collective farm was declared “a threat to the national security of the state of Israel.” In response to the Israeli occupation of the West Bank, a group of people from the town of Beit Sahour decide to buy 18 cows and produce their own milk as a co-operative. Their venture is so successful that the collective farm becomes a landmark, and the cows local celebrities- until the Israeli army takes note and declares that the farm is an illegal security threat. Consequently, the dairy is forced to go underground, the cows continuing to produce their “Intifada milk” with the Israeli army in relentless pursuit. Recreating the story of the “wanted 18” from the perspectives of the Beit Sahour activists, Israeli military officials, and the cows, Palestinian artist Amer Shomali and veteran Canadian director Paul Cowan create an enchanting, inspirational tribute to the ingenuity and power of grassroots activism.